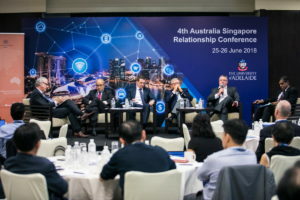 Earlier this week the University of Adelaide welcomed more that 140 delegates from industry, government and academia throughout Southeast Asia for the Fourth Australia-Singapore Relationship Conference which took place from Monday, 25 June to Tuesday, 26 June 2018 at the Grand Copthorne Waterfront Hotel in Singapore. Hosted by our Institute for International Trade (IIT) and the Entrepreneurship, Commercialisation and Innovation Centre (ECIC), with support from the Australian High Commission to Singapore, the conference explored the challenges of digital transformation and the role of entrepreneurship and trade architecture in supporting businesses to leverage the opportunities the emerging digital economy presents. 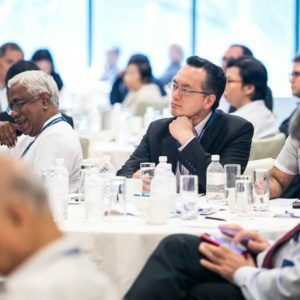 Telemedia an active investor in the Communications, Media and Technology (CMT) space, and renowned expert in comparative an international politics, Professor Joseph Liow of S. Rajaratnam School of International Studies at Nanyang Technological University of Singapore. Over the course of two-days, delegates had the opportunity to engage with more than 20 thought leaders from across a range of fields and sectors, including entrepreneurs, business leaders, policy makers and academics who shared their insights on a range of critical issues for business and policy makers during a series of interactive presentations and discussions. Over the coming week we will be sharing key insights from the conference, in a series of posts on Digital Transformation: Implications for Singapore and Australia.